"How fast" is becoming more clear now. Visual China Group's opening price on the Chinese stock market at ¥9.00 ($1.30USD) on February 3rd 2013 was met with a one-third loss by the close of trading that same day to ¥6.00 ($0.87USD) (Historical: SHE:000681, 2/8/2013) . On June 5, 2015 it enjoyed it's peak valuation at ¥65.87 ($9.54USD) and then plummeted along with the rest of the Shenzhen Stock Market, with CNN reporting (here) that the bubble burst with a 13% plunge in recent days, and by July 2015 the market had slightly stabilized (CNN here) , but VCG had dropped to just ¥25.00 ($3.62USD) or roughly a two-thirds loss since it's peak a month prior. vCG's last peak of ¥40.69 was on December 31st of 2015, just a year ago, but as investors digested the January 22, 2016 news of VCG acquiring Corbis, the stock had dropped to ¥23.50 by late January, peaking briefly in late february to ¥31.28, and it's been downhill ever since then, just 6 days later it dropped back down to ¥24.18 on 2/29/16. In the last month, VCG has dropped to a low of ¥19.13 as of the market close today, 12/14/16, over a 50% loss of value since December 2015, where the Shenzhen Stock Exchange Composite Index has shown a loss of approximately 12%. (Bloomberg - here ), so while the overall market recovered from the June 2015 bubble bursting somewhat, VCG has continued to falter, and falter significantly, further, and faster. The Selling Stock analysis continued "While the demand for photography may be growing (Getty’s numbers certainly don’t show it) prices customers are willing to pay for photos and illustrations are declining more rapidly. The net result is that gross revenue generated by the industry is probably growing at a rate no greater then 5%. " VCG acquired Corbis from Bill Gates in January 2016, and announced a $100 million USD investment in Getty Images in February, amidst it's February 2016 peak, and then plummet. 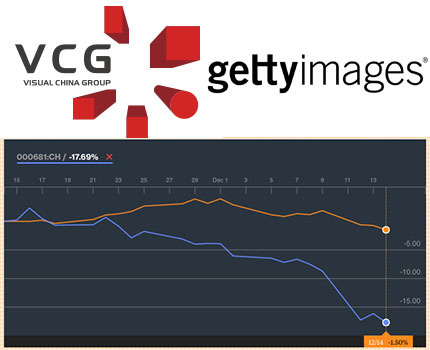 In February, VCG had a market value of $2.5 billion, this in contrast to the August 15, 2012 report in Fortune Magazine (here) which reported that The Carlyle Group (NASDAQ:CG) had acquired Getty Images for $3.3 billion). Clearly, VCG is seeing it's own valuation plummet as many of it's properties are failing. Certainly The Carlyle Group, which was around $25USD at the acquisition in 2012, is hovering around $15USD today, or a 40% decline since then. Just 10 months ago, we opined here "For those in the financial services sector, it's just one more business to watch the numbers on. For those in the trenches of the industry Getty serves, Getty Images is dying a slow and agonizingly painful self-inflicted death. It's like the shrewd investor analyst who actually goes to the farms in Kansas and sees first-hand the crops with lower yields, and gets out while they still can." Since then, VCG has dropped approximately 61%. As we further opined, "Getty Images is near that point where the ships' hull is about to break apart, just like the Titanic. Many with knowledge of this industry know just how low the metaphorical visual "crop yields" are...". To quote the old Verizon commercial, "Can you hear me now?"